When 18th century Euro-American settlers first entered western Ohio, they emerged from the forested Appalachian plateau onto the glaciated plains and encountered areas in which forest gave away to prairie* grassland and oak savanna**. These largely treeless areas and savannas existed in a variety of community types depending upon degree of soil wetness, depth to bedrock, and frequency of fire (i.e. natural and human-caused). This scattered prairie presence in the Midwest is believed to have originated from a post-glacial warm-dry climatic period which favored grasslands over forests. The early settlers avoided the prairie areas thinking that few trees meant few soil nutrients for their crops. In this they were mistaken. Now that the western Ohio landscape has been converted largely to urban and agricultural land uses, the historic prairie and savannas exist only in small remnant areas which have escaped concrete, asphalt, and plow. Prairie remnants on certain railroad right-of-ways and old country cemeteries offer an unforgettable glimpse into the ecological and historic past. But what benefit is there to conduct research on ecological systems that are essentially "a thing of the past?" The answer is similar to the answer of the historian when asked "Why is it important to study history?" It is because a major part of who we are as humans is rooted in the history of our families, our communities, and institutions. Likewise, the prairies and other "natural" landscapes of the past are an integral part of us, our history, and our sense of place. Practically speaking, to understand and manage the valuable agricultural soils of western Ohio, we must understand the pre-settlement prairie communities that formed these soils. Prairie remnants also hold unique species with valuable potential for human nutrition and medicinal use. 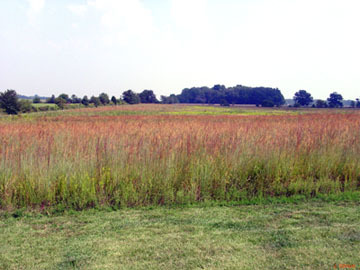 In addition to the ecological and historical significance, prairie restoration on the Cedarville University campus reduces storm runoff and enhances groundwater recharge needed for a growing campus population. Prairies have also recently been shown to store carbon through the highly efficient photosynthetic machinery of the tall grasses. Our attempts to rebuild prairie communities teach us much about the complexity of these natural systems and about how to respect and conserve them as part of our God-given stewardship. Finally, the CU Prairie Restoration Site can be an example of good land stewardship to interest other local landowners in more useful alternative land uses. In the series of webpages to follow, we describe the philosophy, purpose, and activities of the prairie research efforts at Cedarville University. The primary focus is to promote education both among our students and faculty, and in the larger community. Our projects include the CU Prairie Restoration Project and Prairie Remnant Projects along the old railway, now a bikeway known as the "Prairie Grass Path." 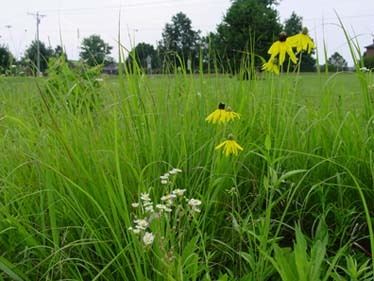 The purpose of the first is to "build" a prairie-like community; the second aims to conserve existing prairie remnants. Take a "ride" on the "Prairie Grass Path" on the web, or better, get on your bike and visit this narrow "slice" of historical and ecological richness for yourself. *Prairie is from the French, meaning "grassland"
**Savanna generally applies to a grassland with many scattered trees.